Marvelous Multiagers! : Gung Hay Fat Choy! We celebrated Chinese New Year this week! We started off the week with my fave, Scholastic News. I just learned a couple of cool things that you might want to know if you have Scholastic News. First, starting soon, you'll be able to level up or level down the issues for your lower or higher readers! Second, I figured out a sweet way to manipulate the Scholastic News website to give me harder activities for my second graders. I like to do the magazine and then give them one of the "skills sheets" because they're usually semi-fun. Well, we get the first grade edition and the skill sheets are waaaaaay too easy. So I changed the website address a bit and now I can access the second grade skills sheets! They look almost the same but they're a little harder. The second graders like having harder work to do, and also this week the second grade page covered compass roses, which we learned about back here! That was a lengthy paragraph that maybe didn't make sense. 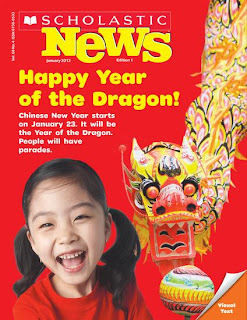 Anyway, we watched the Scholastic News video 3 times and read the magazine and the kids could not get over the dragon! They thought it was amazing. On Tuesday, we made paper lanterns to decorate our room. I found the patterns here and I just used the blank template. Shockingly, first and second graders are NOT too cool for Kai-lan. They are incredibly sensitive about things that they are too cool for, including Dora and Mickey Mouse Clubhouse. We also did tangrams, which I talked about here. 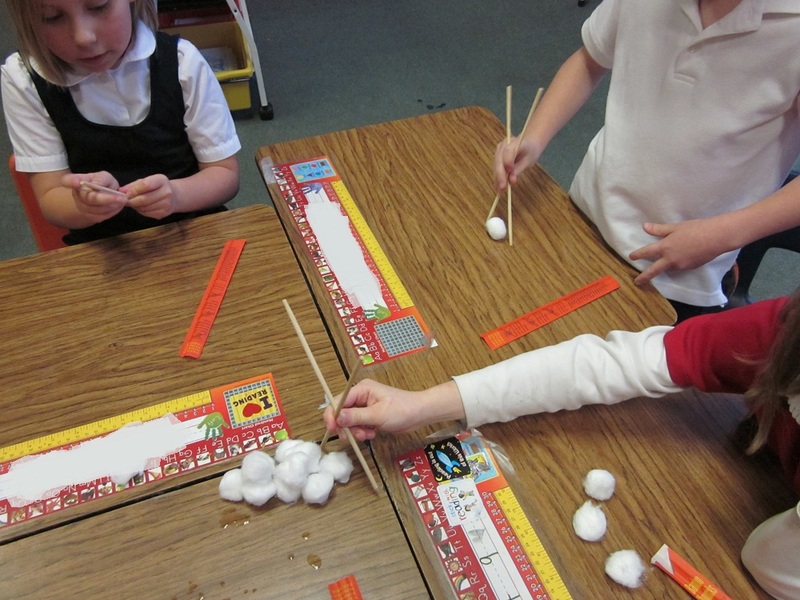 Today, we finished up Chinese New Year by using chopsticks! I was able to get a bunch donated to me from my favorite Chinese restaurant, and the kids were super excited. We practiced picking up cotton balls. I read on someone's blog that her kids practicing picking up little pom poms. I didn't have any of those but I had a plethora of cotton balls! Here's my little teacher helping the first graders! They also ate fortune cookies! They all ended up with really nice fortunes, so that was good. On Monday, I had told them that they were going to eat Chinese food, which really just meant fortune cookies. ALL week, every hour, they asked when we were going to eat Chinese food. I even got this weird pair of notes on my desk that I found after school. They were slightly disappointed that they didn't get noodles. Oh! I almost forgot. 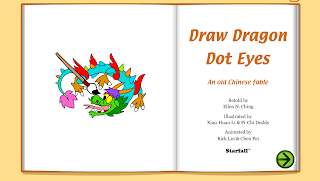 I also showed them this story from Starfall. Click on the screenshot to check it out! It was fun for them to hear a traditional Chinese story, and it gave us a chance to talk about fables! And also morals of stories. The Starfall story was fun too because I clicked on the pictures and they moved around. 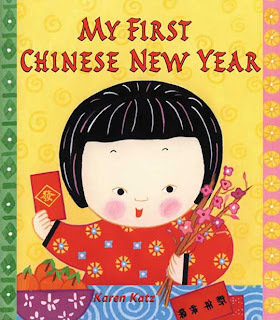 Here are a few of the actual books that I read for Chinese New Year. Both were good! The first was more informational, the second was a fictional story. I recommend them. 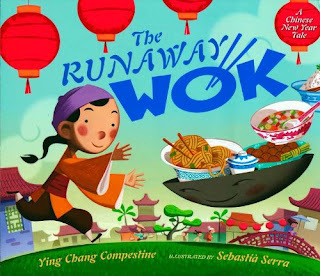 :) I'm actually mad because I saw The Runaway Wok at a Scholastic warehouse sale and I didn't get it.... and now I wish I had. Oh wells. How did you celebrate Chinese New Year? I wish I would have done more but I hope I at least piqued somebody's interest in my class! At one school I sub for, they made lanterns, had red envelopes with chocolate coins, and the teacher made a display wall with pictures from China and Chinese items. The kids loved it! What a great day! I need to make sure our study of China falls during Chinese New Year next year so I can incorporate some of your great activities! Hahahahahaha I love that note you got. Now I want China food. I wish we had time to fit things like that into our instruction, but it's pretty tough. I'm luck I got to spend so much time on Martin Luther King LOL. Thanks for the info about Scholastic - I use them all the time and I love them! Great Chinese new year lessons! My student teacher introduced e Chinese new year to students during home room on Monday. Today they made their own paper lanterns. I'm so jealous that your Scholastic News had a Chinese New Year issue. Some years the kindergarten Scholastic News has one, but this year it did not! I was bummed-I would much rather have had an issue about this fun holiday instead of snow monkeys or penguins!! I love all your activities-the chopsticks were a challenge for my kiddos too-we tried to pick up mini marshmallows. P.S. You have to save some of those funny little notes you get from kids-it is so much fun to look back over them and remember the kids you taught that year long after they have left your class. I'm seriously considering hanging something from my ceiling. I like the lanterns, but we don't honestly teach that subject and my room has a theme. I saw some great ideas on pinterest so don't be surprised if you see me taking the learning to the ceiling. So fun! Love all of those activities! We "celebrated" the 100th day (no Chinese New Year) instead. And I say celebrate with quotes around it because it was the most scaled down version ever because of those darn Cirriculum Cops.